We covered Moleskine’s launch of its new Adobe Cloud-enabled Smart Notebook, but after using one in practice, the tech has clearly merited another look. You can see a live trial of the entire process above, which takes under two minutes and offers up an editable .SVG file pretty much the same as those you’ll get from a $2,000+ digital display and drawing tablet combo. The anchor points on the page mean that the perspective you put on the page is the perspective you get in the digital version, which means if you have a bit of a shaky grasp on that like myself it’s not going to magically correct any of your problems. That said, the resulting vector is much easier to fix and change than would be any scanned BMP or other traditional image file. Plus, using your iPhone’s camera to capture your sketches from the notebook itself is far, far easier than employing any kind of flatbed or hand scanner. Despite the minimal setup and requirements, the app does a good job of recognizing detail, and works even in suboptimal lighting. It’s a first step of sorts, however, for those looking to use it to create production-quality images; even once you’ve got the digital file, some work will generally be required to clean things up and get them ready for color and additional visual effects. 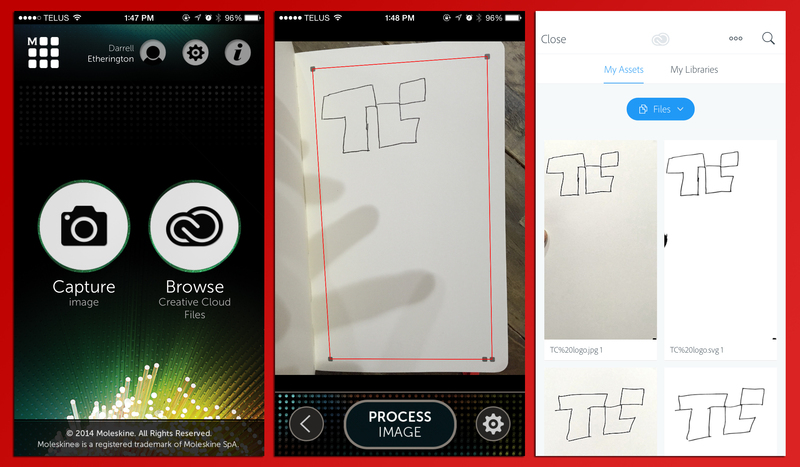 The app (free) and the Moleskine notebook ($32.95) are going to appeal to a specific subset of users who are Adobe Creative Cloud subscribers, own an iPhone and spend a lot of time in Illustrator, but that describes an awful lot of creatives out there. For them, this is almost like having a digital drawing tablet everywhere you go, without any need to worry about charge, all that much weather protection or technical skill. Some other devices, like the defunct Wacom Inkling, have promised similar things, but this is the first I’ve tried that’s worth the hype.